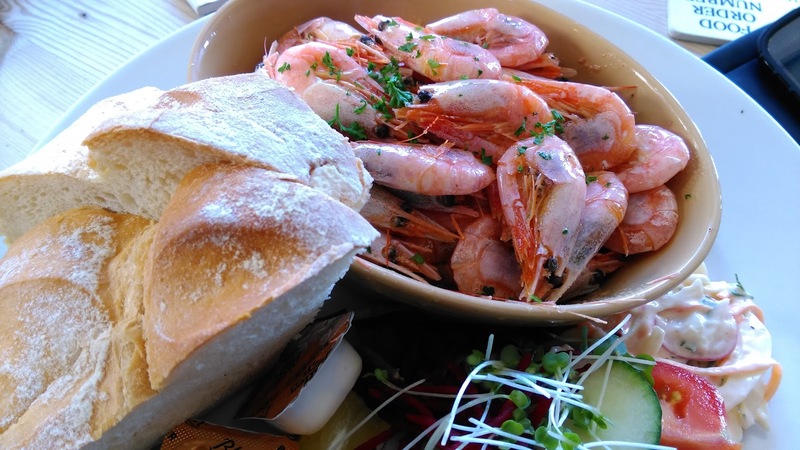 What could be better than a lazy summer's lunch sitting overlooking the sea? When the occasion arises I can't think of a better place to go than to the Isle of Wight. 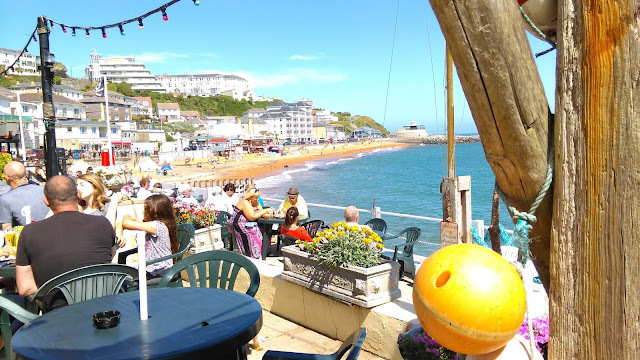 Dotted around its beautiful and varied coastline are a number of pubs and restaurants all serving great local produce but one place we're always drawn to is The Spyglass Inn in Ventnor. Situated at the end of the beach on the Esplanade, The Spyglass Inn has been a Ventnor institution for years. The building dating from around 1830 is one of the oldest in Ventnor. This year The Spyglass Inn celebrates its 25th anniversary of being run by the Gibbs family. In the 18th century the coastline around the Isle of Wight was well used for smuggling purposes with contraband coming across the channel from France. Watchmen would position themselves on the cliffs luring ships onto the treacherous rocks below with a false safety light. With its smuggler hanging off the rigging at the front entrance The Spyglass Inn is full of pictures, photographs and artefacts to celebrate the area's maritime heritage. There are three sections to sit in. On a glorious sunny day like the one we enjoyed then sitting outside overlooking Ventnor bay is a popular option. Inside it can feel like you are on galley boat with small rooms going off main bar area. We opted for The Boathouse which is light and airy but out of the winds that can whip round this southern part of the island. When sitting in such surroundings it's hard to pick anything else other than fish. 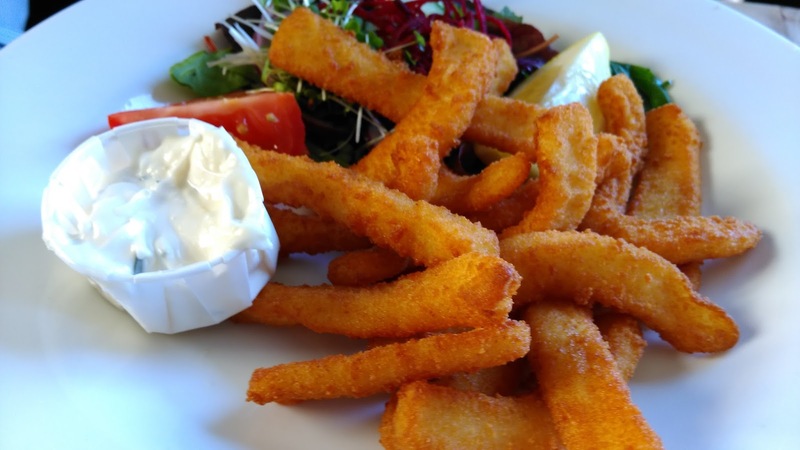 My brother and Miss JibberJabber both went for the Calamari Strips (£9.75) served with a garlic dip. They both said that the calamari was cooked just right and without that awful rubbery texture that overcooked calamari can have. My mother had her favourite of the Smoked Mackerel Ploughman's Platter (£9.95). 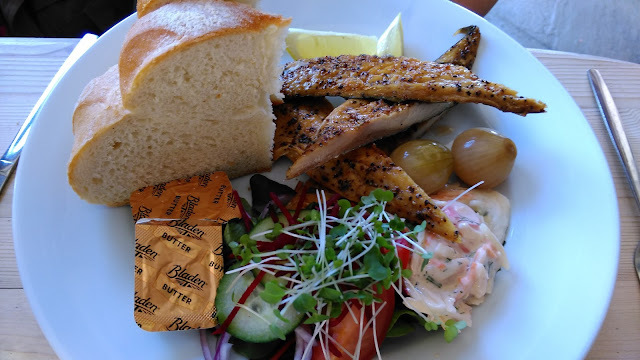 As with a standard ploughman's it is served salad, a big chunk of bread, pickled onions, four strips of peppered smoked mackerel but the pickle is replaced by lemon. 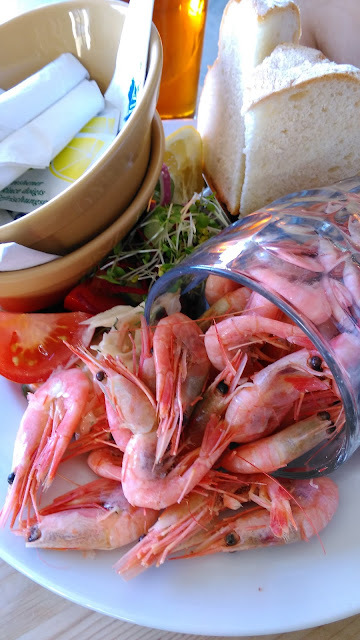 There's not many places that serve the traditional Pint of Prawns (£10.95) so whenever Mr JibberJabber sees it on a menu in the right setting he has to have to. Like my brother Mr JibberJabber decided to wash it down with a pint of Scrumdiggerty from the Isle of Wight based brewery Goddard's. I went for something similar but in the form of Garlic Prawns (£10.95). This was a bowl of shell-on prawns cooked in garlic butter. I know whole prawns aren't for everybody but I find it's the only time you really get a proper taste of prawn. Even Master JibberJabber who is normally a dedicated chicken eater got into the fishy feel of the meal. Whether it was the sight of the sand or the smell of the sea air but he opted for the children's Scampi and chips (£6.95). There may be cheaper places to eat on the Isle of Wight but I think you would struggle to find somewhere with such an extensive fish menu at such prices. In season fresh crab and lobster caught in Ventnor Bay are served and there are daily specials on the blackboard by the bar. 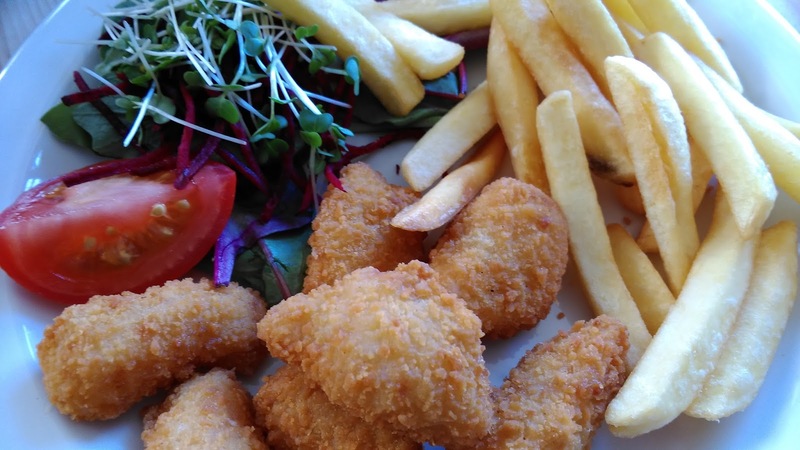 What's nice about lunch at The Spyglass Inn is that you leave feeling full but not bloated. Just right for an afternoon playing on the beach below.